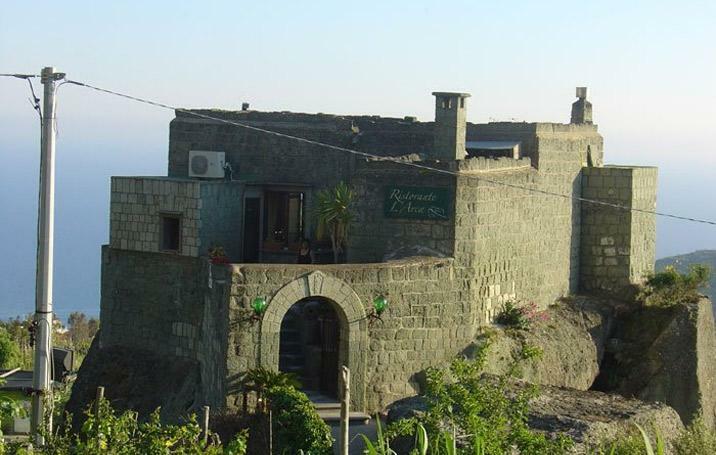 Dug into the rock among the green hills and vineyards of the South coast of the island, the restaurant l'Arca rises up from a huge tuff stone! Specialities of seafood and land products. The cuisine is the typical of Ischia; the menu includes the rabbit stewed in a tomato, wine and herb sauce and Neapolitan pizza. At guests disposal a small park area. Wide choice of specialities of land products and seafood, in addition to the rabbit stewed in a tomato, wine and herb sauce, home specialities by Mamma Filomena, very good the seafood dishes. Positioned oh the South hills of the island, the restaurant is dug into a huge tuff stone, on green vineyards of the zone. Easy to reach it by car, a small parking at customers disposal, positioned to the opposite side. To whoever move on foot the bus stop is at 50 m, the restaurant organize free transfer on request.